Shalom Luani is WSU's first Pac-12 defensive player of the week since 2013. Gabe Marks named to ESPN's midseason All-Pac-12 first team. Washington State free safety Shalom Luani has been named Pac-12 defensive player of the week after a two-interception, 11-tackle performance in the Cougars’ win against Oregon State that included an 84-yard pick six. This marks the first time since 2013 that a Cougar has earned Pac-12 defensive player of the week honors. Damante Horton last earned the award for WSU in 2013 after he notched two interceptions against USC, including one that was returned for a touchdown. Luani, a junior transfer from City College of San Francisco, had a game-high 11 tackles, the two interceptions and a pass breakup in WSU’s 52-31 win against Oregon State. He is the fourth Pac-12 player this season to record two interceptions in a game, and his 84-yard return for a touchdown is the longest of all defensive players in the conference. Luani has started every game for the Cougars at free safety this season and has made an immediate impact. He’s tied for the WSU team lead with three picks, two forced fumbles and three pass breakups, and is second with 34 solo tackles. Luani is a former international level soccer star who switched his focus to football in high school. Yet, his soccer background has helped to mold him on the football field, and you can read about that process here in this story I wrote about Luani last week. Luani is the second WSU player to earn Pac-12 player of the week honors this year. Quarterback Luke Falk earned offensive player of the week honors after the win over Rutgers. Stanford running back Christian McCaffrey and Arizona punter Tim White earned this week’s Pac-12 offensive and special teams player of the week honors, respectively. — ESPN.com selected its midseason All-Pac-12 team this weekend. 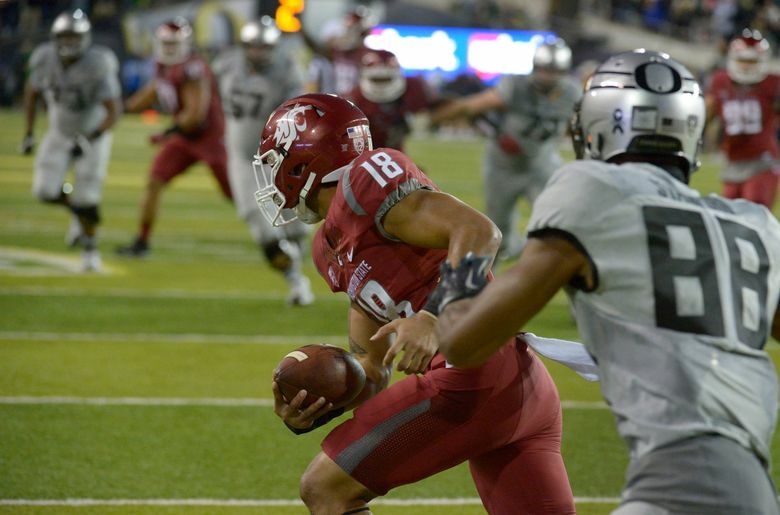 WSU WR Gabe Marks was named to the all-conference first team offense. The junior has more first downs (29) and catches (49) than any other Pac-12 receiver.